2012 July 30 6:30 am. 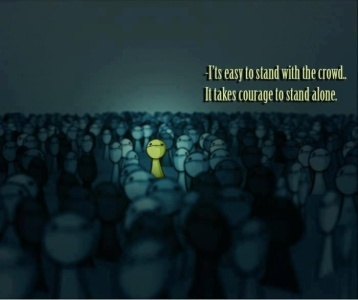 I was thinking of a discussion I had with a friend on Courage. It doesn’t take courage to pretend that you are OK when you’re not. That’s false courage and the illusion and lie that that they present to others so that they won’t feel week, alone, vulnerable, not good enough, a failure, unlovable, and the list goes on and on. Pretending that one is fine by putting on a false bravado and face to others is also a disguised form of unloving heartlessness toward themselves. By pretending that you have conquered, or are unaffected by your physical adversities, or the things and people in your life that are activating you, you are not only fooling others, but also yourself. 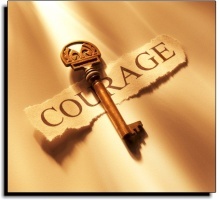 Real courage is not only admitting all the things that you omit, avoid and deny, but to also dig deeper and have the inner strength to not only face your issues, but to mentally, emotionally and physically allow yourself to move what has never been allowed to move, your darkest fear. That is true courage and that is the only thing that will bring light and understanding to what has been denied and in kept in the dark. That is love, unconditional love that can move mountains and give you the life you have only dreamed and hoped was possible. This entry was posted in Denial, Fear - Terror, Feelings - Emotions, Love - Unconditional, Self-Empowerment, Soul (Will) - Intuition-feelings-emotions, Spirit - (Mind) Thoughts - ideas and tagged bravado, Courage, emotionally, false, fears, love, mentally, physically, pretending, real, unconditional by johnrieger. Bookmark the permalink.